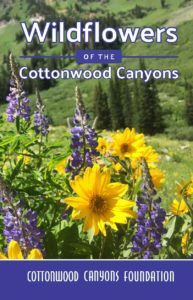 Get your hands on a copy of Wildflowers of the Cottonwood Canyons! The moment we’ve all been waiting for has come: after years of taking photos, adding species, and writing plant descriptions, the NEW wildflower guidebook is hitting shelves! Wildflowers of the Cottonwood Canyons, by our botanist Tim Remkes, contains beautiful color photos of 192 species of forbs, shrubs, and trees. It includes native, non-native, and invasive species in the Wasatch, too! Finally, the book is chocked full of fun and interesting facts about the plants commonly seen in the Cottonwood Canyons. You do not want to be without this guide on your hikes in the Wasatch. Guide books are $25/each and can be shipped across the US for $5/book. You may also pick up books at our office. We also offer bulk discounts with 50 books for $17.50 each and 100 books for $15 each. Place your order by filling out THIS FORM, which will take you to our online store.